Throughout the week, various parts of the tunnel boring machine that will soon start to dig out the Second Ave. Subway tunnel from 96th St. to 63rd St. have arrived at Second Ave. Last night, at approximately 9:30 p.m., the centerpiece arrived as the cutterhead, the part of the machine that will do the heavy lifting arrived. For the project, this arrival was largely a symbolic one. After all, digging out the tunnels is relatively easy and inexpensive. Building out the stations and the infrastructure that supports the subway are the two expensive and time-consuming aspects of the project. Still, for a subway route with a such a long and tortured history, just the arrival of the TBM cutterhead is enough for a celebration. I couldn’t make it up to the Upper East Side last night for the drop, but Ben Heckscher from The Launch Box was on hand for the big moment. He published a comprehensive photo timeline with commentary. He notes that, as you can see in the photo at right, the cutterhead is missing the cutter disks. Those will be installed in the launch box. The cutterhead too has been painted yellow and marked with giant black Qs to demarcate how the TBM will be extending the Q train north from 57th St. underneath Second Ave. Despite the upcoming service changes, the MTA still intends for the Q to service Phases I and II of the Second Ave. Subway. By 10 p.m., the cutterhead had been dropped below street level, and the crowds with their cameras dispersed for the night. The ceremony was over, and the hard work — assembling the TBM and starting the digging — will beg in earnest. One day, our subway line will arrive. In other Second Ave. Subway news, the MTA this week released its latest quarterly update on the project. The full report — available as a PDF by clicking on the image at right — covers the last quarter of 2009, and as expected, the MTA still believes the Second Ave. Subway will be in revenue service by December 2016. The most interesting slide from the report is the timeline on page 16. While some of the execution dates for the contracts have been pushed back, the authority doesn’t believe these delays will impact the overall completion of the project. In general, construction on the actual station structures at 96th, 86th and 72nd Sts. won’t commence until late 2011 at the earliest, and utility relocation and demolition continues apace. The 63rd St. station, however, is due for more immediate upgrades. According to the MTA’s timeline, the design process wrapped up last week, and work on the station will begin this December. This will include the destruction of a temporary wall that seals off the now-unused tunnel that will one day provide a stop for the northbound Q trains and a transfer to the F. The unused portions of this station are visible on this track map. Service on the Second Ave. Subway may still be over five years away, but it’s seemingly going to happen this time around. Can the fourth time be the charm? Too bad that pretty yellow paint job won’t last more than a few minutes of tunnel boring. The whole face of that cutter head will be grinding against Manhattan Schist, breaking up the bedrock and then scooping it out of the way. I’m fairly certain that while the cutter head itself is harder than rock, the pain on it isn’t. Once all of the parts of the TBM are in the launch box and tunneling is underway, there won’t be much evidence of progress on the surface. There will be a constant flow of dump trucks getting loaded with muck over at the muck tower, but other than that, the upper ’90’s might see something vaguely resembling normality for a few months. Until of course, they start building ventilation structures and putting a permanent road deck in. If the MTA were smart, they’d hold on to the TBM and lease it to NJ Transit for the THE/ARC/MTT/ whatever they want to call it now project. I’m sure they’re going to need at least 1 TBM capable of dealing with Manhattan Schist. Then once that’s done, maybe the economy will be in better shape and phase III of SAS will be ready to go. And seeing that it’s got 30 years of “experience”, I don’t think it’s ready to be retired just yet. I wonder how much of it is actually 30 years old, and how many parts are new. Sorry, I meant to say the MTA does not own the TBM. See what happens when you don’t proofread! The blades have got to be replaced semi-frequently, right? Someone with more knowledge? I mean, grinding against bedrock must take its toll. These machines are pretty sweet. Yes, the cutter disks (not installed in this photo) and the scoop blades (see the dark metal on the scoops next to the “Q”) all have to be changed at regular intervals. This requires several sandhogs to crawl through an access crawlspace to the face of the cutter head, where there is nothing shoring up the newly cut rock. A modest proposal: Is there any way NY schools can expose kids to infrastructure projects like this? There has to be some subset of kids that could be inspired to take up engineering after seeing this sort of stuff working away in real time in NYC, making their city a better place. That’s a good and thoughtful proposal. Too bad they had to sneak the thing in at 10 pm. I would’ve loved to see it upfront, I’m only 7 blocks away. Phase 3 will never happen. I wonder…since they’re going to open up the unused platform at 63rd St…are they going to extend the Q to 63rd St first and then up to 96th st? Also…and I know this may be premature…but once phase I is complete with the Q and the N both bypass 49th St? Thoughts? I wouldn’t expect the Q to be extended to 63rd Street during construction. I think it will continue along its newly-revised route into Queens. Remember, a TBM is going to come busting through that stub-tunnel wall on the east side of 63rd Street, and I don’t think they’ll have passenger service at the station at the same time. Right now, that space is used for train storage, and after Phase 1 is complete, the storage will take place north of 96th St in the existing tunnel. Even if the diversion to Astoria were not to be implemented, I wouldn’t expect it to be in-service. Rather, I’d expect the orange tiled wall to be replaced with a blue-painted plywood wall. I hadn’t even thought of that. Silly me. I guess I assumed the stub track ends farther beyond the platform. I hope they don’t put up the plywood wall. But that’s just wishful thinking. I used to live off the Roosevelt Ave stop and would specifically take the F train so I can see the tunnel stubs the go up and down to 2nd Ave. I love that stuff. If the full line ever comes to fruition I hope they don’t cut out that connection. They won’t. 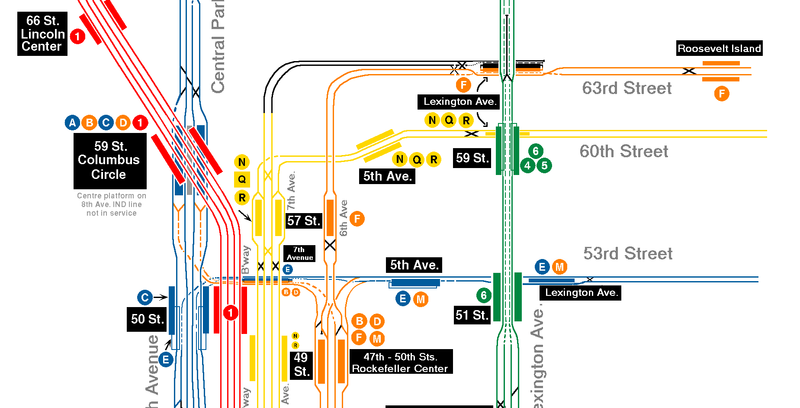 When/If the full line is built, the plan is to run the T up and down Second Ave. and the Q north from 57th and Broadway to 125th St. via the 63rd St. tunnel connection. Do you think they’d use the 2nd Ave/Queens connection to run below 63rd 2nd Ave service to Queens or above 63rd St service from Queens? All this is speculation of course. They have to build the whole thing first. Probably nothing to and from Queens due to track configuration. There’s no switch from the Queens line to the stub tunnel at 63rd St., and I don’t think the MTA has had plans to build one since the three-track SAS plans were discard if they even did in the first place. I don’t think that’s correct. The Queens-to-lower-Second-Avenue track connection is still in the Phase 3 plans, although there are no plans to use it for regular service. The Queens Blvd. line is saturated, which means that if trains are sent down Second Avenue, they would need to be diverted from other routes. I don’t think the Queens-to-2nd Avenue connection will ever be used unless additional capacity is built in Queens, and that’s not on anyone’s short list of projects right now. Trains can’t terminate at 63rd and Lex, since there’s no way to get from the northbound track to the southbound track (they’re on different levels). It’s not a “now-unused tunnel.” It’s used for train storage every day. West of the interlocking, it’s also often used for rerouted R trains.